Complex networks need constant attention and monitoring to ensure your infrastructure can support the systems communicate and perform at peak capacity your users have come to expect. WebWatchBot provides support for monitoring of virtually any server or IP Device that allows it to be pinged over tci/ip. 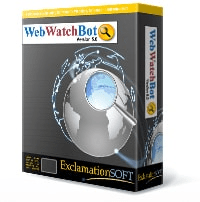 WebWatchBot connects to server via URL or IP Address and a specified port number to verify availability and response time. Perform trace route and monitor total response times and verify number of hops. Industry standard monitoring of hardware and software performance and statistics on local and non-local computers regardless of the operating system.